Though it may look like Carrie and I jaunted around Monterey for a few days, we did, in fact, attend a three-day conference in the mix. 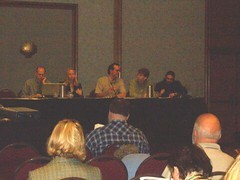 This was our first Internet Librarian conference, and oh, what a conference it was. This is one of those conferences where I couldn't wait to get home and start finding ways to implement and use everything I learned in the last few days from folks who are immensely smarter than I.
Lee Rainie (Project Director for Pew Internet and American Life Project) : Lee gave the opening keynote to a standing room only crowd of about 1000 attendees. He talked about trends in use of the Internet, about how teenagers are using the Internet, the "long tail", about finding political information, and about how the electronic world is evolving. Rainie was funny, at ease, informative and we found ourselves do a lot of "Huh...I didn't know that" during his speech. Very, very cool. Trends and Innovations: A great panel of speakers anchored this session, from David King of KCPL to Glenn Peterson from Hennepin County PL to John Blyberg from AADL to Sarah Houghton from Marin County PL. They each spoke about different aspects of their websites...programs they use, subject guides, and more. By far the most useful for me was hearing Sarah speak - first, she's the author of the kickass LIB blog; second, she spoke about what smaller public libraries without an enormous tech budget can do to pump up services. I was crazily jotting notes down about things I've wanted to do, but now HAVE to do to our website. It's killing me. This was a half and half session for me...the first half was less useful, the second half a shot between the eyes. 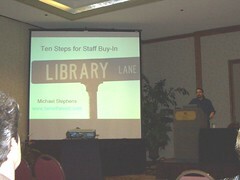 Bernadine Goldman from Los Alamos County PL spoke of her experiences in setting up a thin client in her library. Since this isn't something we're presently exploring, it was less useful to Carrie and I. However, then Aaron Schmidt took over the stage, and I wanted to jump up and down for all that he said. His presentation (“Smart Computing at Your Library” or “Geek to Live, Don’t Live to Geek”) centered on letting patrons really *use* our computers...use the CD drives, IM, burn CDs, USB drives, installing programs they need, gaming, saving files to the desktop...all things I have been pushing for at our library. He made a number of great points about having a cleaning checklist, using Firefox, and protecting from spyware, as well as software solutions to keep those computers running quickly and smoothly (Deep Freeze). I'm so glad Carrie was there to hear his presentation and was able to talk to Aaron afterwards about their staffing and number of computers. I hope together we can come to a compromise on letting our patrons use our terminals, instead of keeping them locked down for good, which I hate. Future Tech Trends for PLs: This was a panel discussion from a number of the day's previous speakers about where they see technology heading in the future for PLs. 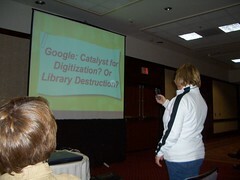 Sarah has a nice summary of the session on her blog, as well as slides from her presentation. Much of what was discussed throughout the day was revisited...the future importance of RSS and Wiki collaboration, social participation online, giving users the computing they need, and much more. A great session to round out a great day of presentations. 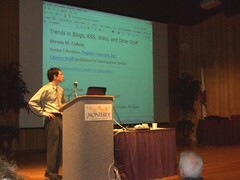 What's Hot & New in RSS, Blogs & Wikis: This presentation was from Steven Cohen of Library Stuff, and his presentation covered a laundry list of new sites that use socialinteraction, tagging, ratings, and a slew of resources to make life easier. He showed demos of a number of sites, which was really great for newbies, and I had to laugh when he mentioned that so many of these sites are "still in Beta" (such as Google News, which has "been in beta" for 2.5 years). 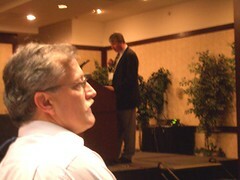 Little was said about blogs or wikis, since the crowd in attendance were pretty much up on that technology. Fun! Wednesday morning was our last morning of getting up before the sun, the fabulous free breakfast, and of kickass keynote speakers. 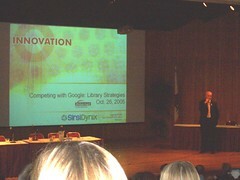 This morning, we got to hear Roy Tennant and Rich Wiggins "face off" on the top of Google's planned digitization of library materials. 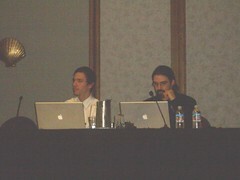 Wiggins is much in favour of the project, while Tennant has reservations. The speech was made even more informative when Adam Smith, the PROJECT MANAGER for Google Print, took the stage and was pummeled with questions. CNN Library Intranet: Sunny McClendon is a librarian for CNN - and man, am I jealous of her job. She gave a talk about the intranet used by the news organization, and let us actually walk around the site and see some of the features included in the CNN library. 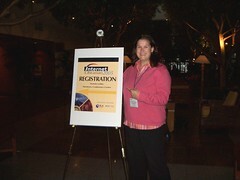 Carrie and I both got some tips on what to include on our soon-to-be-here intranet at APL. Fostering Collaboration with Wikis and Weblogs: This was a presentation that turned into a sharing session about how and when to best utilize blogs and wikis, both internally and externally. Expert Reviews of Real-World Intranets: Unfortunately, I only caught the last 10 minutes or so of this presentation, as I was rendered useless by a wicked migraine in the early afternoon. What I saw of the presentation was neat, though Carrie admitted she didn't care of the style of just ripping apart different intranets with no suggestions of how to make them better. Yeah, that Adam Smith's a hottie.